Former Strikeforce welterweight champion Nick Diaz wants a shot at UFC middleweight champion Anderson Silva and he’s willing to move up to 185 pounds to make it happen. Fans will recall Diaz (26-8, 1 NC) “retired” inside the Octagon following a five round unanimous decision loss to Carlos Condit for the UFC interim welterweight title back in February. A rematch with Condit (28-5) was floated about but was quickly shot down after it was reported Diaz had tested positive for marijuana metabolites in his post-fight drug test and received a one year suspension from the NSAC. Anderson Silva’s (32-4) manager recently came out saying a fight with UFC welterweight champion Georges St-Pierre is the only fight that makes sense for Silva right now. However, Condit is first in line for a shot at St-Pierre (22-2) to unify the 170 pound title later this year. Gracie said Diaz has been frequenting the gym more and more over the last couple of months and is training harder now than he has for many of his fights. 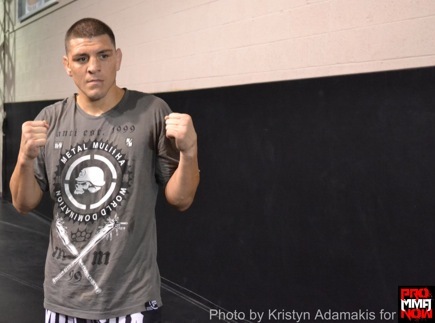 He believes training and fighting is in his DNA and it is who Nick Diaz is. Gracie went on to say he had a great talk with Diaz this week and Nick made it clear that he is ready to fight again. The bottom line is, one of the most talented 170-to-185 pound mixed martial arts fighters of all time, will fight again — and that news my friends, should make this a very happy Saturday for you.